Protect your products with our superior quality A3 Postal Tubes. This page on the site is designed to help you identify suitable postal tubes for A3 size paper. Though of course they can be used for other items. Strong Defenda A3 Postal Tubes. 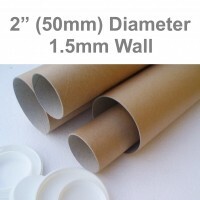 The most commonly used size Postal Tubes for A3 posters, artwork etc are 330mm long x 50mm diameter or 13" x 2” in imperial size with a 1.5mm wall. These tubes provide a high degree of protection and a reasonable size diameter to prevent curling of the contents. 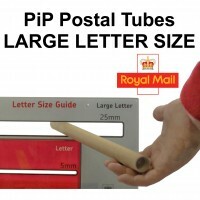 However, we offer A3 postal tubes in slightly longer lengths for oversized A3 items. We also produce them in narrow diameter and wider diameters. 38mm diameter A3 postal tubes are popular but their narrower diameter can lead to undesirable curling of the product. For those wishing to reduce curling to an absolute minimum our 3” & 4” diameter A3 cardboard postal tubes are an incredibly desirable option. We manufacture in various wall thicknesses and hold stock of 'Extra Strong' Heavy Duty 2mm wall A3 postal tubes. We also produce cardboard A3 size postal tubes in an Extra Heavy Duty form with a 3mm wall for clients requiring greater levels of protection. Though these super strong tubes are held in smaller quantities. 1.5” Diameter A3 Size Postal Tubes 13” Long - 330mm Long x 38mm Diameter﻿Good quality narrow diam..
A3 Size Postal Tubes 13" Long x 2" Diameter - 330mm Long x 50mm Diameter﻿If you're looking to b.. Heavy Duty A3 2” Diameter Postal Tubes 13” Long or 330mm Long x 2” or 50mm Diameter﻿ with an Ex..
2" Diameter A3+ Size Postal Tubes - 355mm Long x 50mm Diameter﻿Our 14" long A3 postal tubes are manu..
3” Diameter (A3) Postal Tubes 13” Long - 330mm Long x 76mm Diameter﻿Strong A3 cardboard Postal Tu..
3” Diameter (A3 plus) Postal Tubes 14” Long - 355mm Long x 76mm Diameter﻿Strong cardboard A3 plus..